I have lived most of my adult life in northwest Pennsylvania, surrounded by a sizable Amish community. For the uninitiated, the Amish are the “plain people”, devoutly Christian, and descendants of German immigrants who arrived in the 19th century. They live in houses without electricity or indoor plumbing, and drive horse-drawn buggies instead of cars. Most around here live from farming, although some also do woodworking or other artisan crafts. They have a strict dress code, and even speak their own language among themselves, a derivative of German that is incomprehensible to contemporary Germans. They are an interesting bunch. 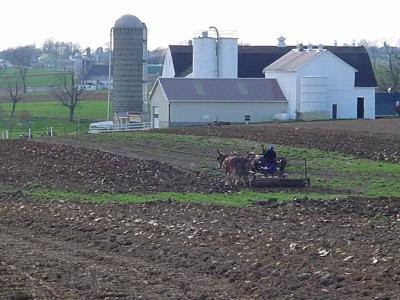 A common stereotype of the Amish is that they reject all technology. While it is certainly true that they do live a decidedly “alternative” lifestyle, it is not true that they live exactly as their forebears two centuries ago. Although Amish do not own cars, they gladly accept rides into town from their “English” neighbors. Years ago nearby here, there was a lonely phone booth out in the middle of a cornfield that was frequented by Amish needing to make calls. Today, my Amish friend David has a cell phone with voice mail that he uses for his farming business. But…it is kept in an outbuilding next to the greenhouse, not in his home. I’ve heard of other Amish using solar panels to power a lamp or two (safer than oil lanterns, you know) but not connecting to the grid. I’ve seen Amish at the supermarket filling their carts with tortilla chips, cheese doodles and soda. These same people will home can enough of their own garden produce to get through the winter without purchasing vegetables. So, you’re thinking, what’s my point? Stay with me! I do have one. After nearly two decades of living among the Amish, I have grown to admire and respect them. They are a hardworking lot, and seem to be happy and content overall. What has made the deepest impression on me is their relationship to technology and the “modern” world. The Amish control technology, rather than letting it control them. David found that a phone was a true necessity to do business, but he set boundaries on its influence on his life by placing it outside his home and utilizing voice mail. Instead of jumping up from the dinner table to answer the phone, he makes and returns calls when he sees fit. The “solar panel” Amish use this very high-tech device in order to avoid the risk of house fires in homes with elderly or young children, where a standard open flame lamp is simply too risky. Even so, they do not give in to the temptation to add ever more solar panels to power ever more gadgets. For “English” like me, it is very easy to develop an unhealthy relationship with technology. The ringing phone during dinner demands to be answered! That email can’t wait! I’m never simply “out” as long as I have my cell phone. And of course, the latest and greatest new gadget entices from the store shelf. Enough already! Setting limits and boundaries on technology is not only better for our mental health, but for our spiritual life as well. So, sometimes I turn off the cell phone and simply go out. I let the email sit in the inbox for a while, and resist the desire for the newest thing in the electronic store. I might not be ready for a horse and buggy just yet, but when it comes to technology, I think I’ll go a little Amish. What an interesting read Rebecca! I grew up near the Amish in Ohio but had no idea about their integration of modernity.